If you’re like most advisors, your client relationships are likely underserved. We live in a world where the power of social networks is seemingly overtaking the perceived value of one-to-one exchanges. Some professionals are looking for a new perspective on client relationships— one that moves beyond surface-level interactions and encourages more meaningful engagements. We know that Galliard Family Business Advisors genuinely care about serving others and enjoy seeing their clients thrive through their contributions—such is the Galliard Way. At the Client Experience Institute, we see this abundance mindset as key to building profound client relationships. In a networked world, your brand isn’t your company, your marketing message, or even your product. Your brand is the sum of your client’s experience at every interaction through the client lifecycle. 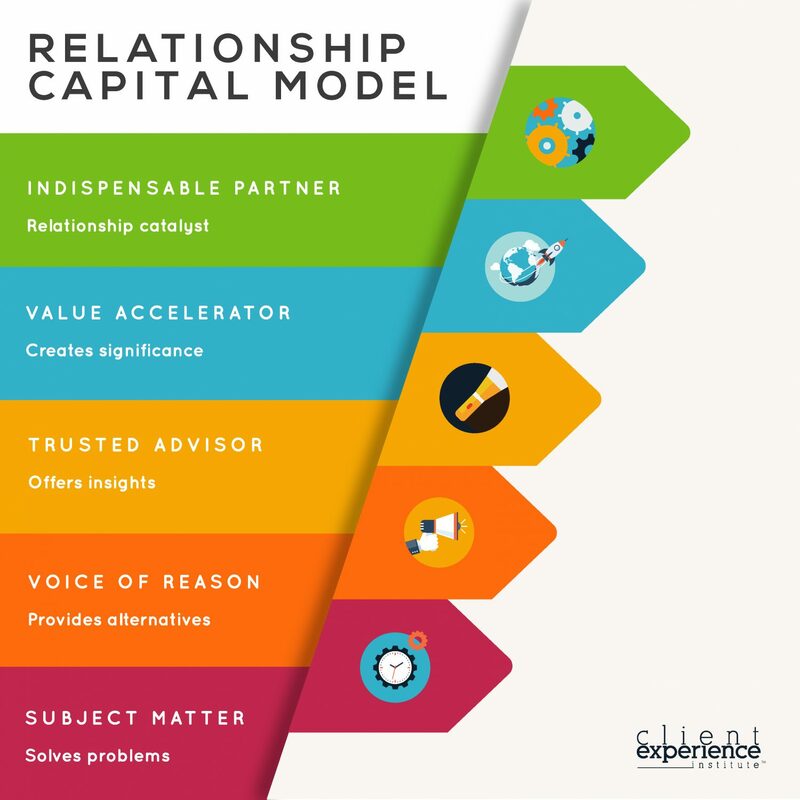 We have created a model to explain the different levels of impact that advisors can have with clients by cultivating Relationship Capital. Over time, each personal interaction you have with clients creates a distinctive value. This value, called Relationship Capital (RC), is measured by the quality of your behaviors, traits, and interactions over the course of a relationship. RC is a direct reflection of your character as experienced by those who know you and can testify as to your qualities. Relationship Capital is a direct reflection of your character as experienced by those who know you and can testify as to your qualities. Creditability – a quality that allows others to believe in you by what you say and do—words, intentions, and actions. Integrity – a quality of honest and truthful motivations by the actions we take. It is our ability to deliver on the promise. Authenticity – the quality of being genuine and representing who we are. What kinds of relationships are you building with your family business clients? Browse through the levels below and consider which description applies to your style and current skill level. Possess deep domain experience and perceived as being authentic, credible and trustworthy to stakeholders. Offers insights when requested and relied upon for their functional expertise. Not considered instrumental to the broader success of the business. Majority of interaction is functional in nature but often of important impact. Known as a critical thinker and creative problem solver who is willing to offer different perspectives. Comfortable in challenging others for the sake of providing alternative viewpoints and options. Perceived as an educator, counselor and enlightener. Recognized by the client as being practical, insightful, and an important contributor to the success of the function/business. Earned the right to provide advice without hesitation and is mainly aware of the key developments impacting the organization/department/professional. Viewed as a contributor to the advancement of the client’s success. Through personal commitment and the resources of others, able to impact the enterprise by enhancing revenues, optimizing costs, avoiding risks and improving business processes that contribute enterprise value. Invests significant relationship capital to demonstrate relevancy at the functional, business and personal levels. Viewed as a catalyst, sought after for their judgment. Creates new performance standard for others to be measured by. Recognized for their wisdom, resourcefulness, and decision-making capabilities. As you reflect on these insights, it is incredibly important to recognize the critical role we play as advisors. We must move beyond our own individual functional expertise to impact privately held businesses with the ultimate goal of perpetuating the enterprise by delivering greater value beyond our own four walls. As we learn and grow from this process of thinking, remember we live in a world of plentiful networking opportunities where our challenge is not to unveil more connections, but to unleash more meaning. Furthermore, it is about investing in people to exchange relationship currency, accumulate reputation capital, and build professional net worth. The Client Experience Institute™ was co-founded by Marc Rosen and Judy Bodenhamer. CEI is an Ohio-based advisory firm specializing in serving organizations who are all about delivering more value, more knowledge, and more results to their respective stakeholders. We work with like-minded professionals who are willing to think differently about how value is created, delivered and sustained. To learn more, visit our website at www.clientei.com.